Customer Experiences with Soul: A New Era in Design will shift your understanding of design, innovation, strategy, leadership and branding. It provides the guidance needed for developing, structuring and implementing customer experiences with soul, helping you to build and grow authentic businesses and organisations which honour what it is to be human in our world. Customer Experiences with Soul: A New Era in Design is published by Holonomics Publishing and launches in May 2017. Holonomics: Business Where People and Planet Matter describes a groundbreaking approach to implementing profound transformational change in organisations in which solutions are ones which engage people across the whole organisation, develop strong cultures, trust among members and effective communication. The Holonomics approach describes a powerful new way of thinking which teaches educational leaders how to innovate and solve problems creatively by using four ways of knowing – thinking, feeling, sensing and intuition. Holonomics brings biomimicry, systems thinking, spirituality, nature’s interconnectedness, philosophy, literacy, physics, biology, business and the five universal human values of peace, truth, love, right-action and non-violence all together in a way that opens leaders’ eyes to uncommon dimensions of thought that have very practical applications. 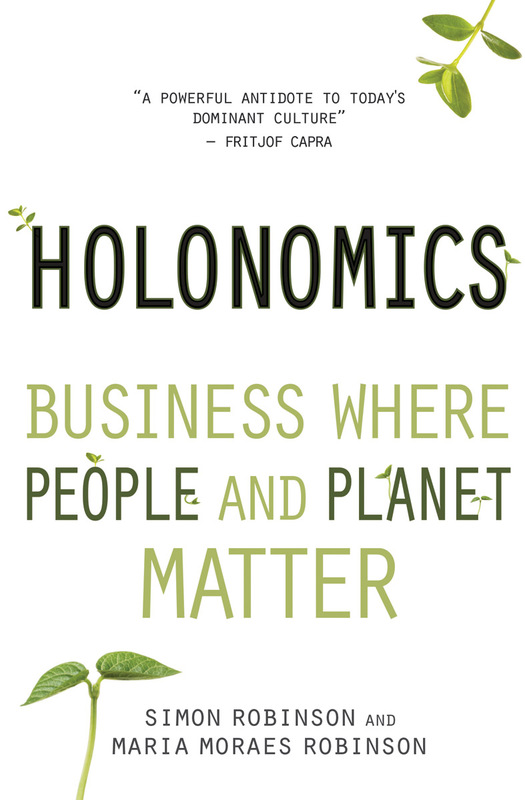 In January 2015 Holonomics: Business Where People and Planet Matter was selected as one of Sustainable Brands Top 36 Sustainability Books alongside both older, well-known books like Biomimicry, Natural Capitalism and Cradle to Cradle, and more recent influential books including The Responsible Entrepreneur, Flourishing Enterprise, Corporate Diplomacy and The Big Pivot. The video below shows Simon and Maria opening plenary presentation at Sustainable Brands London from November 2014 in which they discuss Holonomics and also a new case study in which holonomic thinking was introduced into the core strategy of a large organisation.